Providing you the best range of dewaxing section with effective & timely delivery. 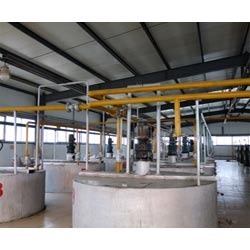 We are the eminent manufacturers, suppliers and exporters of Dewaxing Section designed to provide precise results that cater to the exact requirements of our customers. The traditional crystallization process is followed in dewaxing section where low and high melting triglycerides are differentiated by a partial crystallization process that is later followed by filtration procedure. The refined palm oil pumped through a PHE to heat up the oil above the final melting point. In order to fully destroy the crystals present in the oil phase. After wards the oil is cooled in a controlled manner to the separation at the room temperature or below the room temperature and it is depend on varied melting point of the oil. During this cooling step super cooling occurs, which result in nucleation and crystal growth. Looking for Dewaxing Section ?